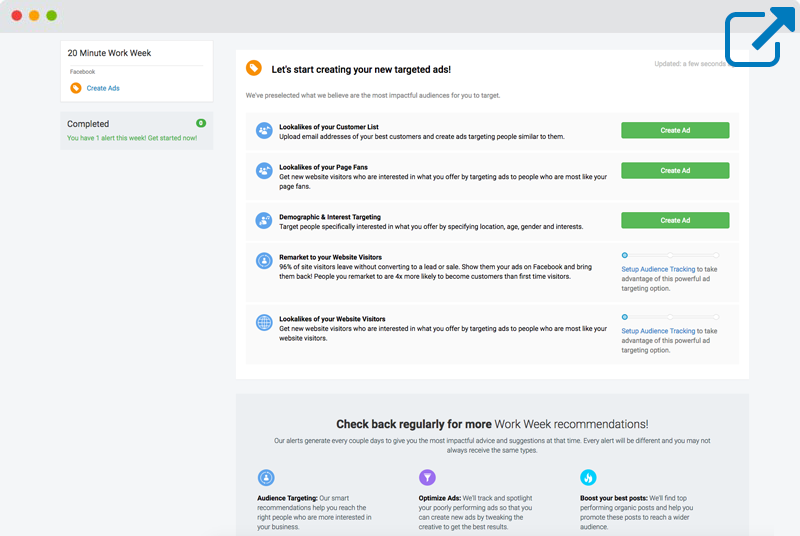 WordStream Advisor makes Facebook advertising easy AND effective, with guided workflows and powerful tools to help you succeed in the constantly changing digital landscape. Advertising on Facebook is a huge opportunity. We'll help you take advantage of it. Connect your Facebook ads account with the click of a button. First, we'll help you focus your budget on your best prospects so you can grow your leads and sales -- immediately. Next, we'll get to work discovering new high performing audiences so you can keep increasing your return on spend. Since [WordStream] took over our Paid Search Campaigns and Facebook Campaigns [...] our CPA is 2 times cheaper than before, while CTR is 20% higher! WordStream Advisor provides support for all of your current and future advertising needs, at no extra cost to you. Extend your success with Facebook by expanding your campaigns to Google Ads or Bing. We'll combine all of your performance metrics into one easy-to-use dashboard, so you can increase your results without increasing your effort. The WordStream team is incredibly helpful, not just in learning their software but in helping us understand how to better manage and use Google Ads. They have several options for help including; email, live-chat, phone and consulting sessions. We have used all of these options with great success! Easy to Grow Bulbs increases conversions by 158%! Right off the bat, Kathleen from Easy to Grow Bulbs was amazed at how WordStream took the complicated process of finding the right audience on Facebook and simplified it. Kathleen was able to easily run remarketing and lookalike campaigns through WordStream to find customers and her conversion rates skyrocketed! The more I work with WordStream the more I think ‘What would I do without it?’ Everything works so well, from the 20 Minute Work Week to the social tools – I’m definitely addicted.